Today I drew inspiration from a brand new RFC to add a post to this little series: RFC-5635, Remote Triggered Black Hole Filtering with Unicast Reverse Path Forwarding (uRPF). Especially, I would like to focus on section 4 of this RFC, Source Address RTBH Filtering. To fully understand this post I would suggest to read my previous post Remote Triggered Black Holing. What is source-based RTBH? and what are the differences with destination-based RTBH? Until now, in my previous posts, I always talked about destination-based RTBH. But a source-based RTBH filtering exists too. This mitigation technique allows an ISP to stop malicious traffic (let’s think to DDOS) on the basis of the source address it comes from. 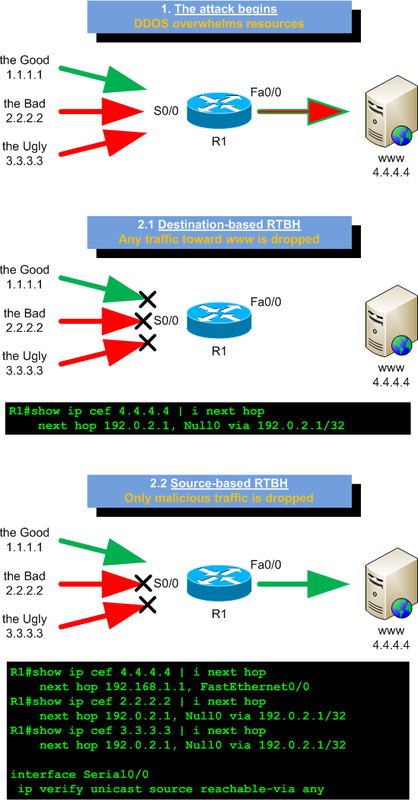 Indeed, destination-based RTBH can just be used to stop traffic on the basis of the attacked hosts addresses, or in the best case, on the couple attacked-hosts/incoming-upstream-provider (you can use different BGP communities to black-hole a prefix only on specific edge routers). As mentioned in the RFC, if a DDOS software is instructed to attack an host name rather than an IP address, even if you change the IP address resolved by that host name, the attack won’t stop. In this scenario you just have to disrupt the whole service by filtering out the attacked prefix. Source-based RTBH can help you! Source-based RTBH uses Unicast Reverse Path Forwarding (uRPF) as background mechanism to work. uRPF performs a route lookup of the source address of the packet and checks to see if the ingress interface of the packet is a valid egress interface for the packet source address (strict mode) or if any route to the source address of the packet exists (loose mode). If the check fails, the packet is typically dropped. 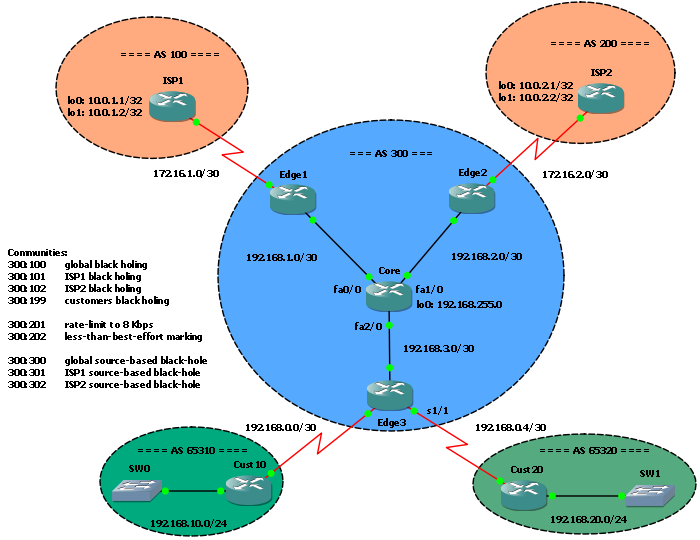 So, in order to stop incoming traffic from hosts A, B and C toward host Z through router R we just need to add discard routes for A, B and C on router R. And, as seen for destination-based RTBH, we can do it using BGP and communities. Well, no! Some policy enforcements are due! As first, in the same way we did for destination-based RTBH, we must use the no-export community to be sure our black-holed prefix doesn’t leave our AS. Our policy must accept prefixes outside our network (while destination-based RTBH only accepts prefixes within our network) and, as a rule of thumb, we should not accept source-based RTBH prefixes from our customers, but we should just use this tool from management workstations under our control. The starting configuration is the one we left on the post BGP triggered rate limiting and less-than-best-effort (LBE) with QPPB. Here, 300:300 and 300:301 communities (community-list 5) are welcome, while 300:302 community is not accepted – it’s only for ISP2 facing router. Moreover, we just accept prefixes external to our network (192.168.0.0/16). Now, suppose we have an attack from ISP1 Loopback1 toward Cust10 (so, from 10.0.1.2 to 192.168.10.1). As you can see, both source addresses can’t reach our host. You can download the updated GNS3 file and configs here. The ZIP file contains multiple config subdirectories, one for each step covered on previous posts, and the new “6. Source-based RTBH filtering”. This is a pimp lab. Cant wait to try it out.